Alicia Augello Cook (born January 25, 1981), known professionally as Alicia Keys, is an American R&B singer and songwriter. She has sold over forty-one million albums and singles worldwide as of 2007, and has won numerous awards, including fourteen Grammy Awards, eleven Billboard Music Awards, five American Music Awards, and fourteen NAACP Image Awards. 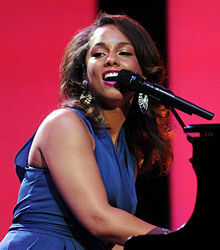 Keys was born on January 25, 1981, in Hell's Kitchen, Manhattan, New York City, New York. Her birth name is Alicia Augello Cook. She is the only child of Teresa Augello, a paralegal and part-time actress, and Craig Cook, a flight attendant. Her mother is of half Italian and half English, Irish, and Scottish ancestry, and her father is of African American ancestry. Keys has expressed that she was comfortable with her mixed race heritage because she felt she was able to "relate to different cultures". Alicia Keys is half Black, half White. She identifies herself as African American. She grew up in a Black neighborhood. Her music has primarily jazz, blues, or piano interludes. Keys at Tokyo Summer Sonic 2008. ↑ "The Diary Of Alicia Keys [CD & DVD] [Limited] - Alicia Keys". Epinions. February 2, 2004. Retrieved 2008-02-14. ↑ "Alicia Keys Biography". Allmusic. Retrieved January 2, 2014. ↑ "A lot of people believe I'm part Jamaican, though I'm not. I'm definitely black and Italian and a little Irish or Scottish" (European American) – Bream, Jon (April 28, 2008). "More Keys to Alicia's Life". Star Tribune. Retrieved January 2, 2014. ↑ "Alicia Keys – Keys Avoids Mixed Race Abuse". Keys first appeared at a Talent show on "Jessie Jones" where she performed alongside "four little women" who were also an unknown group at the time. Both were signed to a record deal after the performance.Contactmusic.com. December 1, 2004. Retrieved January 2, 2014. Wikimedia Commons has media related to Alicia Keys. This page was last changed on 1 March 2019, at 09:39.